The SAMR model guides educators to new teaching methods through technology. The SAMR teaching model guides educators to new teaching methods through technology. John Dewey, the American philosopher, psychologist and educational reformer whose ideas have been influential in education and social reform, once said, "If we teach today’s students as we taught yesterday’s, we rob them of tomorrow." Considering the blistering pace at which technology is evolving, the exponential growth of knowledge as a free commodity, and the Common Core State Standard's focus on the application of skills, concepts and understandings, this statement is more relevant now than ever. 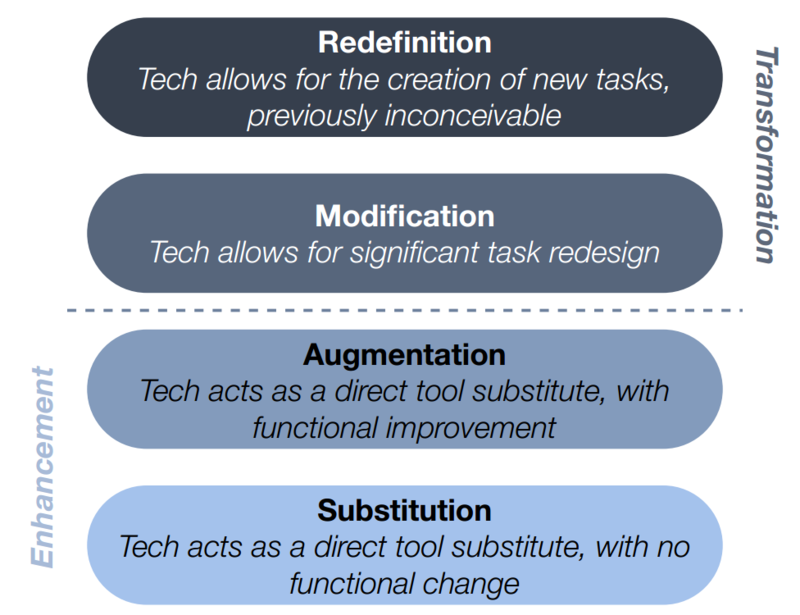 The SAMR model (Substitution, Augmentation, Modification, Redefinition) is an effective and meaningful way to integrate technology into the classroom. Dr. Ruben Puentedura, creator of the SAMR model, notes that in order to move students from traditional learning places to innovative learning spaces, we must employ the rich use of technology to allow them to explore, create and use every affordance of these devices today. Dr. Puentedura posts his presentation slides on his blog under a Creative Commons license that allows them to be reproduced by others, with attribution. While we could easily debate where a teacher’s use of technology fits into this model, the real value of SAMR is in helping teachers know whether they’re simply substituting something old for something new (for example, notes on paper versus notes on the computer), or rather integrating technology in a manner that enables new teaching and learning opportunities. Here are document and video examples of the SAMR model in context. At its root, SAMR is an excellent guide that helps teachers self-reflect and create the awareness that if students are learning fundamental skills, such as the four C's (creativity, collaboration, communication, critical thinking) without digital tools, they should continue to do so if the teacher’s use of technology does not significantly redesign a task or create tasks that were previously inconceivable. Reflective teaching suggests that teachers take a look at what they choose to do in the classroom, think about why they do it and consider whether or not it works — a practice of self-observation and self-evaluation. Furthermore, by gathering evidence about interactions in the classroom and analyzing and evaluating this information, we recognize our strengths as well as the areas in which we need improvement. Exploring our pedagogical approach and underlying beliefs will ultimately lead to changes and improvements in our teaching — moving up the SAMR model from enhancement to transformation when integrating technology. If educators are going to successfully move forward into this new era of teaching and learning, we must erase the notion that technology is something extra for them to do in addition to the curriculum. We are preparing students for their future, not our past. Technology and education do not exist in separate silos, and the sooner we embrace this new reality, the better prepared our students will be for their future. The game has changed for teachers, and tools such as SAMR are invaluable resources during this transformative period in education.